It seems a bit presumptuous to call something “the best,” doesn’t it? But I couldn’t resist, because these really are the best fajitas in the world. The entire world. No, wait, the entire galaxy. Because I have an obsession with trying new recipes, I am always on the lookout for different versions of the same thing. I mean, look how many chocolate chip cookie recipes I have on here – and I love every single one. And rolls? Don’t even get me started. But when it comes to these fajitas, I will not try another recipe. Them are strong words…but that is just how much we love this one. This is in the top three of my husband’s favorite meals (right up there with sweet and sour chicken) and although I hesitate to nail down my own favorite meals, this is definitely up there in the ranks. Amid all the new recipes I try each month, this recipe still makes a regular appearance and nearly bowls me over with it’s phenomenal flavors each time. After marinading, take chicken out of the bag and discard the marinade. Grill or broil the chicken 5-7 minutes per side. Remove from grill or pan and tent with foil to keep warm. In a large nonstick skillet, heat 1 tablespoon oil over medium heat and add the onion, mushrooms and peppers. Stir fry until softened but still crisp tender. Add soy sauce, water, lime juice and salt and pepper. Cook another 2-3 minutes, stirring frequently. Slice chicken thinly on the diagonal and toss with the vegetables in the skillet. Serve immediately with flour tortillas and top with tomatoes, lettuce, guacamole, cheese, sour cream…the options are endless! Liquid smoke may seem like an unnecessary, optional ingredient but I promise it adds an irreplaceable flavor and smokiness – I keep a bottle of liquid smoke on hand in the refrigerator just to make these fajitas. Recipe Source: Mel’s Kitchen Cafe/originally from Erin W.
I tried this recipe because my crew despises cumin. My hubby can smell 1/4 tsp. in a potluck batch of mexican food. This marinade is so, so good. I left out the lime juice so I could marinate the chicken overnight (but served with lime wedges). I almost didn’t add liquid smoke because I knew I would use a charcoal grill to cook the chicken breasts, but the seasoning was on point. Thank you Mel for such a yummy – cumin free! – dish. Glad this one was a hit! I wonder what it is about cumin your husband hates?? 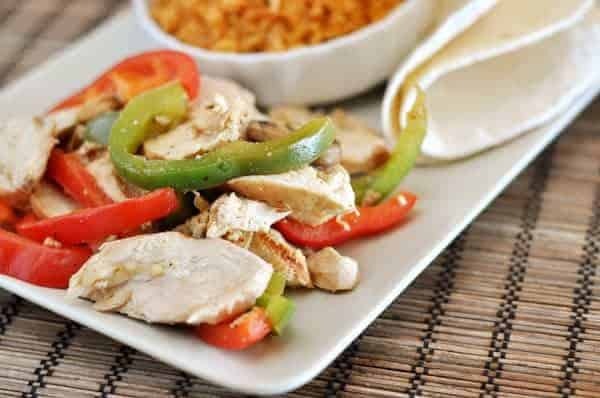 This is my go-to chicken fajita recipe. I just made these again for the umpteenth time and they tasted phenomenal!!! I absolutely love this recipe!! What do you think would be the best way to adapt this for the crock pot?? I’m not sure, I haven’t tried it – maybe cook the chicken in marinade ingredients and then add the veggies for another hour? Truly the best fajitas!!! Have you tried this marinade for steak fajitas yet?? We LOVE this for a weeknight dinner or even for company! So much flavor! Another winner Mel! Seriously, this stuff is goooood. Didn’t have liquid smoke, but I’m sure it would have made it that much better. For two adults I used one large chicken breast with half the marinade. One green one red bell pepper, half an onion, one portobello mushroom. I eat mostly the veggies and my husband makes his more equal parts chicken and veggies. Excited to have some leftovers for lunch tomorrow! Definitely 5 stars. Your recipe collection is the best I’ve ever come across. Your recipes have been feeding my family probably 3 times a week for at least 3-4 years. So thank you!! I have an instant pot and am learning to use it more and more – have you ever made these in the IP? If so, how did you do it? Thanks again for having such awesome do-able recipes. We love Mel at our house!! Hi Brooke – thanks so much for your sweet comment! I haven’t made these fajitas in the IP…but I bet you could. Probably 8-9 minutes high pressure? Delicious! I loved the soy sauce-lime over the veggies. Thank you! Made these tonite and they were awesome!! Can’t wait to check out more recipes on your site!! I love this recipe! has anyone tried to make and freeze the marinade with chicken? I know this is a year later but… I have frozen this marinade with good success. I also have just added the marinade to frozen chicken breasts and then let it thaw in the marinade in the fridge. That works too! So, I just have to tell you that you are definitely my go-to girl for all things food. I am obsessed with your blog and check it regularly. My husband makes fun of me because I’m always saying things like, “Well, Mel said it’s better refrigerated” or “Mel said to do it this way”, like I spoke to you in real life or just got off the phone with you or something. Anyway, I’ve been DYING to try this fajita recipe and asked my husband to make it for us the other night (on his night to cook, only once a week – I promise I’m not evil!) and of course he made fun of me again when I told him where the recipe was from. He said, “What did Mel say this time?” to which I replied, “She says it’s the best fajita recipe out there.” The fajitas were to die for (of course) and my husband would not shut up about how amazing the chicken was. I gave him a hard time and asked, “So was Mel right?” and he said, “She was pretty spot on.” You are #1 in our book! Thanks for all your amazing recipes! If you ever stop blogging, my family will suffer. Haha. Haha! This was awesome; thanks for making me smile and totally making my day! I am so in love with this recipe. My boyfriend asks for them at LEAST once a month! The flavor is to die for, even better than some fine Mexican restaurants we’ve been to. NEVER take this recipe out of your “Bests”!! I follow it exactly, minus the mushrooms. I usually place my oven rack a six or so inches from the top and use high or low – doesn’t really matter (and probably will depend on each individual oven). Just keep a close eye on the chicken so it doesn’t burn. I just made these for the second time for a big crowd–so super delicious! Hi Mel! I live in Australia and liquid smoke is not available here. Would smoked paprika be an acceptable substitute? Or something else? I know nothing can actually replace the flavour of liquid smoke, so I’m kind of grasping at straws here!! Hi Laura – I’d probably go for the smoked paprika. It won’t give the exact flavor of liquid smoke but will give a nice depth of flavor. Good luck! Could you marinate these for longer than three hours? I’d like to do this before I go to work. Thank you!!!! Sally – Yes, absolutely! I often marinade the chicken overnight. thanks for the recipe!! the fajitas turned out great but I have a question for you. The marinade calls for 2 tablespoons of oil and later on in step 3 one tablespoon of oil is mentioned. Is that an extra tablespoon of oil or one of the 2 for the marinade? drodgers – You use 2 tablespoons oil for the marinade and then the marinade gets discarded. You use an additional tablespoon when you start sauteing the veggies. I hope that clears it up! 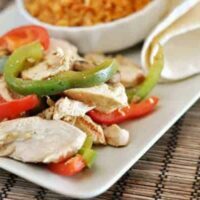 I completely agree with you–these are the best chicken fajitas! They were fantastic. We had them with fresh tortillas and the regular Mexican toppings and we thoroughly enjoyed them. Thanks for another fantastic recipe! 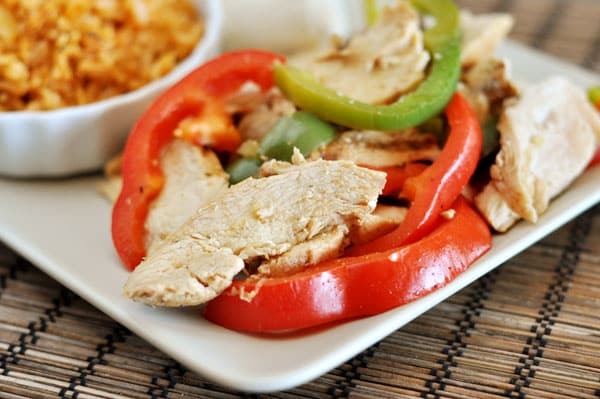 This is my go-to recipe for Chicken Fajita!! If my boyfriend wasn’t such a Mexican Food Nazi,i would eat these every night!!! My love for you Mel is getting deeper and deeper!! lol! i don’t have an indoor grill – could i bake the chicken or fry in oil? Mary – Sure. Or broil in the oven. We hosted the Elders to dinner last night and I had already planned to make fajitas and i already had your refried beans recipe going in the slow cooker. I went to your blog to look for a better Spanish/Mexican rice recipe and sure enough (and gratefully) you had one. From your blurb about the Mexican rice I noticed the link to your fajitas recipe. I have been using the same fajitas recipe for the past few years and like it, but since you raved so much about yours (and since I had an unopened bottle of liquid smoke in my pantry – an ingredient I’ve never used) I just had to try it. Oh my, they were so good!! I’m throwing out my old fajitas recipe!! In fact our whole dinner was from your recipes and it was all so good! Everyone just kept commenting on how good it was. Thank you for a wonderful dinner!!! As a side note, I made your Mexican Rice recipe with brown rice (in a pressure cooker) and it was wonderful! Had these tonight and they were delicious! The first recipe I tried of yours was the sweet and sour chicken…loved that too! I love your blog and recipe ideas…thanks! Just tried this recipe today. WOW! These fajitas were fantastic! This recipe is a keeper for sure! Thank you! Even my finicky boyfriend raved about these fajitas, and that’s saying a lot! I will be scouring your recipes for more to try! I hope you and your family have a fabulous Christmas!! The chicken is marinating, the veggies all cut up & waiting! The marinade smelled absolutely delicious! Hi Mel: I have made these fabulous fajitas hundreds of times and am going to have them for dinner today but was just wondering, what side dish do you like to serve with these?Thank you so much for all of your great recipes! Brittany – that’s a good question! I make any of the following (or a combination): cornbread, mexican/Spanish rice, fresh fruit and vegetables, cottage cheese, black bean and mango quinoa salad. Hope that helps! Omg, I have made these several times now and they are so delicious. I just got done marinating 6 chicken breasts and now im completely drooling wishing it was supper time already!! A+ Mel! Way to go!! This was delicioso! I made one and threw 2 in the freezer for later. I just cleaned off the George Foreman grill to put it away and it occurred to me that I didn’t even serve cheese with it! My oldest OCD daughter would prefer that the ingredients were more uniform in nature so she wouldn’t get whole chunks of onion at a time. I guess I will put hers in the blender next time 😉 Will make this one again. Another hit! I am working my way through all your favorites! Thank you for some good ones. Made this for dinner tonight along with the Baked Spanish Brown Rice and it was delicious! Totally do-able on a weeknight and everyone left the table happy. The only thing I did differently was to sautee the peppers and onions with some southwestern seasoning for a little additional spice, but I loved the combination of soy sauce and liquid smoke. Will absolutely make again. I have tried this marinade before and it is fantastic! This time I put the marinade and chicken in the crock pot all day on low and shredded the chicken. I served them as chicken tacos and it was great! Thanks, Mel. I love your blog. Chipotle Tabasco in these is wonderful, too! It isn’t as hot as regular Tabasco, but has the best chipotle flavor! Vanessa – I’ve never used corn oil so I’m not sure. Sorry! will using corn oil make a difference? These really are the best fajitas. I made them tonight, along with your yummy Mexican rice, sliced avocado, and the toasted corn black-bean salsa from America’s Kitchen Healthy cookbook. Just one was super filling but super good. I can’t wait for leftovers for lunch tomorrow. The chicken marinade is so easy and super flavourful– I would make the chicken on it’s own again too. these are the best fajitas i have EVER had!!!! just simply amazing, made them tonight, and everyone loved them!!!! my dad said it was the best chicken he has ever had!!! These are really good we had them for supper tonite, I added black beans and small chucks of pineapple instead of the mushrooms. Awesome thanks Mel! Made these for dinner tonight and they were wonderful. What a great recipe! I have made these a few times and I must say, I like them better without the soy sauce. When you leave it out, the lime really shines, which I like because it tastes more Mexican-y. I think if I had to choose one thing to eat the rest of my life, it would be these. I can’t wait to try it with beef. I used chipotle chili powder and left out the mushrooms….I love mushrooms, just not in fajitas. I also just cooked the chicken in the pan before i did the veggies…my grill is on winter vacation and I wasn’t in the mood to turn on the oven. They were perfect. I will try the grill this spring. I have a friends old family recipe for tortillas….I love them because not only are they divine, but the recipe calls for oil instead of shortening. These fajitas were amazing on homemade tortillas. I love food and have a hard time committing to say what my favorite is, but I think I can commit to saying these are in my top 5. Thank you for an amazing recipe! Best. Fajitas. Ever. My husband could not stop talking about how good they were! Thanks for another great meal! You aren’t kidding when you say these are the best. We LOVED them!!! My husband even claimed we would no longer be going to the dive mexican restaurant in our town. How in the world does a suburb of Chicago have NO good mexican food?! Have you ever made your own flour tortillas? I made these for the second time the other night and they are wonderful! I only omitted the mushrooms which I don’t like, but yes, this has earned a place in my cooking repetoire, but only with corn tortillas! Thanks! We made these tonight for the second time. This time I cut the breasts in half and marinaded it over night. OH MY GOSH! These really are the BEST chicken fajitas EVER! The flavor of the chicken was so perfect that I did not add any salsa to my fajitas burrito because the flavors alone were so yummy. I have a night that I have to cook for everyone at Lake Powell in June and this is going to be the meal. I plan to freeze the chicken in the marinade before the trip to save a step. Do you think that would work? Any ideas for lunch at Powell to feed 20+ people? Lunch is my nemesis. This might be a really dumb question, but what is an indoor grill pan? I’m wanting to make these. They look so yummy. [email protected] (here’s my email address, I don’t see a subscribe to comments on here). Hi BriAnn – an indoor grill pan looks like this and basically is a pan with ridges that you can heat on your stovetop and grill indoors. Hope that helps! I’ve made lots of homemade fajitas, but this recipe is definitely the best one yet. My husband was going crazy over them. Thanks so much! (I love “The Best Recipe” section and wish more recipe blogs did something similar!). Hey there – Just made these for lunch and they were IN-SANE!!! We absolutely LOVED, LOVED, LOVED them and they have been promptly put in next weeks menu plan as well! I will definately be blogging about these….seriously, WOW! Sieglinde – thank you! I’m glad I’m not the only one who could seriously eat these babies for breakfast, lunch and dinner. Just tried these tonight–they were fantastic!!! Thanks so much! Thanks, Lisa! Glad you loved these. Missy – yes, I think skirt steak would work great here and if it is on sale, even better! Well this was yet another winner of a recipe! I made this yesterday for some friends who came over. My friend doesnt eat white sugar or flour so we actually just ate this as is and it was SO DELICIOUS! believe it or not this was my first time eating fajitas! wat took me so long?! I could seriously see this being served over white rice too..infact I know for sure I will be trying it that way. I want to experience it with the flour tortillas and everything else so I will be making this again..probably this week..lol Thank you!!! Sonya – yes, this fajita base would be delicious on many other applications. So glad you liked this! I made this tonight for my husband. I don’t eat peppers and onions but he liked it. I used beef instead of chicken and kept some of the meat separate and cooked it for myself. We both really loved the flavor profile of your marinade (We let it marinade over night.). Thanks, Casper – I’m glad that this worked out well for you and your husband! Made this using top sirloin – delish!! My kids new favorite. They all want it for their birthday dinners. PottsFam – that’s adorable that this is the birthday request. My kids do that all the time, although there requests never stay the same so I usually have to ask them the day before their birthday just to make sure something hasn’t changed! Just found your website and I’m excited to try it all! I’ve been on the lookout for the “best” recipes for quite some time and I think this may just be the last place I look. As for guacamole, I think the secret ingredient is Miracle Whip. I know, you’re going to say, “no way”. But I get rave reviews every time I make mine! I do the avocados, lemon juice, garlic, chopped onion, pepper, salt, diced fresh tomatoes, cilantro, and Miracle Whip. FABULOUS! oh so yummmmmy!!!! these were ‘dinner’ last night!!!! thank you so much! fabulous recipe! WhollyMothers – so glad you liked these, and don’t worry, I usually eat two (if not more after I’m done picking at my kids’ plates) also. Thanks for the note about the printables. I’ll fix! Hi Melanie! These are seriously the BEST fajitas. We just had them for dinner. In fact, I ate two. Quick note – you might already know this, but on the printable version without pics (I didn’t look w/pics), the mushrooms have been omitted. Marcie and Doug – so glad you liked these and welcome to the blog! Thanks for commenting and stopping by. Can’t wait to try this one! We love fajitas! This will make an apperance at our house soon! Thanks! yep you should really make all these AMAZING recapies into a book!!!! This is one of the first recipes I ever tried on your blog and you are right, it is FANTASTIC. There is no way I would ever use another recipe for fajitas. I have even used it on venison and man alive, it is outstanding! It’s one of my favorite meals to make. Thanks for sharing! Where can you usually find liquid smoke at the grocery store? My family loves fajitas so i will me making these soon! I wish I had found this recipe a few days ago because we had fajitas last night for dinner…but yours sound better! Lucky me, I just bought a bag of bell peppers from Costco! I spy mushrooms in your picture, do you add those with the peppers and onions? Jordan, grocery stores are set-up differently, but I find liquid smoke in the condiment aisle (pickles, olives, etc.). A popular brand is Colgin Liquid Smoke and it comes in a 4 oz. bottle. It’s normally by the chili sauce, hot sauce, etc. I have two bottles in my fridge now and I use it a lot – also good putting some in raw hamburger meat (before you grill), stews, chili and of course, fajita meats. Thanks for another great recipe – just wrote down the ingredients I don’t have on hand…this is supper tonight. we’re huge fajita fans! I can’t wait to try this!! We absolutely LOVE fajitas! I just so happen to have 3 large chicken breasts left from a family-size package I bought yesterday and I think I’m going to use them to try out this recipe! Your picture is making my mouth water already!!!!! Jenna – so glad you like this recipe! Cammee – I do use mushrooms in mine but it is up to preference. I’ll add it in as an optional ingredient in the recipe. Jordan – I find liquid smoke by the barbecue sauce/ketchup/worcestershire sauce in little glass bottles, about 4 ounces each. Becca – liquid smoke is basically smoke in liquid form (I know, way to restate the obvious) and it gives meats a delicious, smoky flavor without cooking over specialty woods (like hickory). I’m sold; these look fabulous. girl, if you say these are the best, then they must be the best. i can’t wait to try them! I’m pretty hungry and this isn’t helping. Looks super! It’s nice to meet you. Your blog is terrific! I’m on a quest for a good guacamole recipe. Do you have one? Your fajitas look really good. I have a good recipe too that I’ll be posting as soon as I have a chance. Awesome! My husband and I were just talking about finding a good fajita marinade since the store-bought ones are so salty! I can’t wait to try this one. I love your site and recipes. I have a bunch flagged to try out! Danielle – I don’t really have a tried-and-true recipe for guacamole…usually I just mash up the avocado, sprinkle some kosher salt and fresh black pepper and then add some lemon juice and diced tomatoes. I know Alton Brown has a highly rated one on the food network if you want to check there. We just made these for dinner and they really are The Best!!! My husband said to add it to a weekly rotation!! Thanks for another amazing recipe!! I made these on Friday and they are very yummy. The chicken had wonderful flavor and a house full of kids ate them up. Now I just need to find a good spanish rice recipe! These were AWESOME!! Seriously the best fajitas I have had in forever! The liquid smoke is killer! What great flavor! Thanks for the great recipe! Leslie – I was excited for someone to weigh in on these after the post, so thanks for letting me know you liked them! Sonya – glad these were a hit! I’m also looking for a good spanish rice recipe and found one on simplyrecipes.com that I have yet to try. Let me know if you find a good one! The Conrad Family – I agree the liquid smoke makes these amazing…thanks for letting me know you loved them! if you want to check it out. Or not. I know you’re busy! Hey Loralee – I’m glad you liked this recipe. I’m off to check out your post. I made these for dinner tonight! Mmmm! Delish!!!! Soooo yummy.